Photo by Helen Bryan: A pod of white pelicans sunbathe after a long migration, right in time for the White Pelican Celebration. The Historic Ted Smallwood Store and Museum held its much-anticipated first annual “White Pelican Celebration” with a considerable number of attendees and entertainment. Cars lined up on the lot at the entrance of the water’s edge location. A little rain and chilly breeze over the weekend was not enough to disrupt the three-day event. In fact, it is even in accordance with the infamous bird the event is named after and its migration patterns – the cooler, the better. What makes this museum unique is having authentic displays of its days as an outpost general located in what is known as one of Florida’s last frontiers. Today, it continues to connect cultures by bringing the community together. Local merchant stands lined the path leading to the Museum. There were jewelers, homemade jams, and various pieces of Seminole culture to be purchased. Most importantly, the food stand had a continuously growing line. There were large pots over an open flame that allowed for fry bread to be made in sizeable batches. The food was fresh and delicious, having a variety of Seminole cuisine, Indian tacos, gator nuggets, five pounds of stone crab and Key lime pie. Visitors had the opportunity to partake in boat tours and to walk through the general store that contains over a thousand artifacts dating back to the early 1900s. It is a wonder that the store still stands strong even after weathering hurricanes and our tropical weather for over a century. Underneath the Smallwood Museum, an instructional wildlife presentation was facilitated. White pelican specialists Dr. Tommy King and Marsha Sovada described what makes up the habitat of the American white pelican, as well as its migration patterns. After learning that the American white pelican migrates over 3,000 miles each year, you may very well have seen this bird up north before visiting the Southwest Florida area. This event was more than a gathering of the local community; it was an opportunity for fundraising the museum’s survival. Locals know the legal battle the Museum and owner Lynn and husband Gary McMillan endured over the last four years. Corporate land developers Florida Georgia Grove tried running the historic landmark out of business to repurpose the land and blocked access of the only road leading right to the museum. In March 2015, the battle closed with the county declaring “Mamie Street” a public road. Part of the settlement involved the county agreeing to maintain the street going forward. A song performed by Native American song writer Rita Youngman and JRobert recounted the situation and cleverly titled the epic “Bonehead” in direct regards to the land developers. Narrating the effort it took to keep the Museum standing today, the song had a hint of humor and truth behind each verse. You could hear the music from inside the museum throughout the entire area as you walked around. As the weekend came to an end, next year’s event is already in the works. There were many musical guests, as well as local community leaders in attendance that were true gift to the cause. A few names among the list were: Chief James Billie, JRobert, Raiford Starke, Pete Gallagher, Cindy Hackney, Rita Youngman, and Frank Thomas. The Smallwood Store, established in 1906, is the first registered historical site in Collier County now standing as a museum, located on Chokoloskee Island. 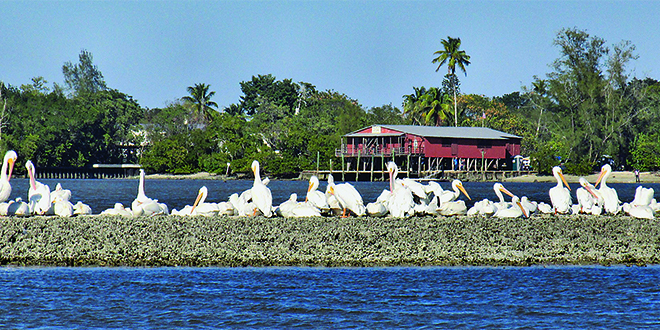 This historic landmark is also home to the American White Pelican. For more information about the Smallwood Store and Museum visit www.smallwoods.com or call 239-695-2989.